Find out how to Play Joker Jester Slot and which online casinos offer Joker Jester for real money play. Bingo - A Positive activity? Joker Jester slot has it spot on, the bright colours and beautiful graphics make this 5 reel 20 payline slot a definite treat for the eyes. And the scatters, wilds and bonus games make this a high paying and highly entertaining slot. In the Egg Juggling Bonus round, which opens when three egg basket symbols appear across reels 1, 2 and 3, the Jester gets to test his skills by juggling eggs. The player can add more eggs to his juggling routine, with each egg increasing the bonus multiplier, but be careful, the Jester might be a world class juggler, but he has his limits! Should he drop an egg, all multipliers are lost. There is however some help - should you reach 10, 25 or a 100 multipliers, you have the option of "locking" at these, so not all is lost. The second bonus round, the Barrel Bonus game, the player is shown 10 barrels. Each chosen barrel will award a prize, but choose carefully - should the Jester be in the barrel, the bonus round will end. The Barrel Bonus round is triggered when the Barrel symbol appears anywhere on reels 3, 4 and 5 at the same time. 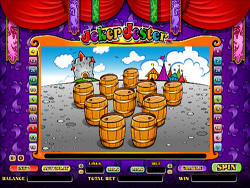 The Joker Jester slot also features various scatter symbols. The Egg Basket and Barrel symbols start the various bonus rounds, and the Jungle Balls scatter symbol completes various winning combinations, provided two or more appear. The best part about these scatter symbols - to win with them, they don't even have to be on an active pay line! Other symbols in this slot game are the Castle, a Lute, an Ace, King, Queen, Jack and Ten. 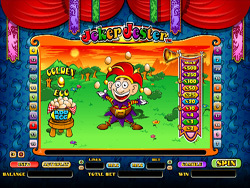 All in all Joker Jester online slot is a fun filled, highly entertaining game that will keep players entertained with all the regular wins, bonus rounds and of course all the crazy antics of the Jester!